We look back at last year’s Black Mathematician Month, and give a preview of what to expect this October. by Nikoleta Kalaydzhieva, Sean Jamshidi, Eleanor Doman and Jessie Renton. Published on 4 October 2018. Happy October everyone and welcome to the second instalment of Black Mathematician Month! As you may have noticed, diversity in higher education has been in the news a lot recently and this is not without reason. We strongly believe that mathematics should be open to everyone, regardless of education, age or background. There has been very little progress in improving diversity in our field, and this is why we, as mathematicians and science communicators, think it is important to continue the discussion of the effects, as well as, what needs to be done for things to change. As a result we are working to actively promote the work of black mathematicians throughout the entirety of October alongside Black History Month in what we are calling Black Mathematician Month. But before we give you a sneak peak of what you should look forward to this month, let’s look back at what we did for Black Mathematician Month 2017. We kicked off the month with a piece looking at statistics on ethnic diversity in maths and why we think an initiative like BMM is needed. In the subsequent four weeks we interviewed several prominent black mathematicians and published the transcripts as a series on our website. After speaking to a few of them, it was clear that there is a lack of black role models in maths and science. This is why our goal for last year was to highlight and celebrate the achievements of black mathematicians from around the world. Our interviews included conversations with the mathematician, professor and activist, Talitha Washington, and the British mathematician Tanniemola Liverpool, who helped run the first university access scheme that focused on ethnic diversity. 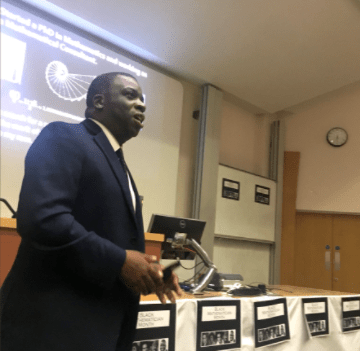 We also published an article by Lassina Dembélé, reflecting on his life and journey as a globe-trotting number theorist. American academic Jonathan Farley also wrote a piece about his experiences as a black mathematician, and the racism he has encountered in his career. If you happened to have missed those, or a year is too long ago to remember, you can find these and many more here. Dr Nira Chamberlain at the closing ceremony of Black Mathematician Month 2017. Although we are very proud of the articles we published last year we didn’t want Black Mathematician Month to be a one-off project. We strongly believe in the cause and we realise that it takes more than one year for change to happen. Instead we need to use the momentum that has been building over the past 12 months, with Stormzy’s scholarships and Jocelyn Bell’s PhD studentships, and build on it by continuing to shed light on this important issue. This year our aim is to be more proactive and focus on the younger generation, as we believe that this is where the change should come from. We are very excited to be organising a mathematics enrichment day for Y9/10 students of African-Caribbean descent or mixed black backgrounds. The event will consist of engaging workshops run by students from UCL and Dr Naz Miheisi from King’s College London. There will also be a guest talk by Dr. Nira Chamberlain and an appearance by the Tottenham MP David Lammy. But that is not all! We will also publish articles throughout October written by black mathematicians about their work, as well as pieces that explore current initiatives tackling the lack of diversity. So stay tuned!